And now, the first batch of beers from that beer run in Gainesville a few weeks ago. They really had a great selection of beers I can't get in BR or in Houston, so I went a little nuts. 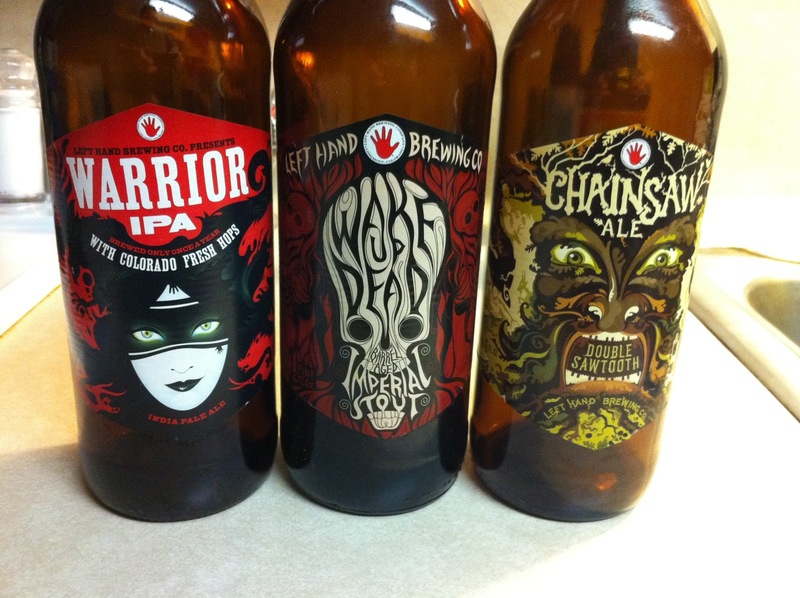 Among the beer haul was a trio of bombers from Left Hand Brewing out of Longmont, Colorado. I've seen their beers in Alabama before, and now in Florida, but never in Louisiana unfortunately. I've tried a few of their 12 oz. brews in the past, the Milk Stout and Oktoberfest for sure, among a few others, but never any of these three. Last time I had any was a trip to Alabama a few years back and they can't have anything larger than 16 ounces, so these 22 ounce bombers would have been illegal! Poor Alabama... at least they're not Mississippi. Warrior IPA: A well above average IPA, hoppy up front with just a subtle hint of some caramel malts. Very citric on the tongue, but not so bitter than I didn't want to keep drinking. It's brewed with all Colorado hops, giving it a little different feel than most IPAs using Pacific NW hops. Worth checking out for any hop head out there. Barrel-Aged Wake Up Dead Imperial Stout: A good looking stout on the pour, with sweet and boozy aroma of toffee and chocolate. The taste was as expected, but a little weak. Not much of the barrel-aging notes come through and there's not a lot of balance. It's a decent beer overall, but for the style it's below average I think. This one has some really bad reviews out there, but I didn't find it to be an awful beer, just mediocre. Chainsaw American Strong Ale: This one was kind of weird for me, and really required a different approach than most beer... as in... I had to drink it somewhat warm to really enjoy it. The first few sips I had when the beer was still quite cold were brutal. The aroma was fantastic with hints of caramel and dark fruits almost like a brandy. The taste was just bitter hops and hard to swallow. After that I let the beer warm to closer to room temperature the flavors mellowed out and each sip was better than the one before. I know it's an odd approach to take for a beer, especially the way 'frost-brewed' is bombarded into us by the big advertising, but trust me, it's the way to go for a beer like this. And with that, 3 more down on the resolution. I actually went slightly out of order in my reviewing as I had a Stone Cali-Belgique Ale in between these three, but I wanted to mention all the Left Hand beers in one post. That's called creative liberty... or something. I'm still right about on pace, and have a nice stockpile at home for the next month or more. Draft Magazine's 100 Best Beer Bars In America! New Poll Up... Vote Away! Beer Cocktails - Dark Wood Flip? Beers 1 and 2 in 2011.